I have used the 804 for the past three years. I highly recommend them. I get 6000 to 9000 miles from them.I mostly ride dirt and use pavement to get me to a riding area and sometimes for fun. On pavement it works great, little to no noise, no rolling of side wall, hold pavement well and stops great. Off road it is a tough tire, tracks well on soft and intermediate terrain, handles rocks well. The only down side is it does tend to push in deep sand. I don't have any real wet road experience since I live in the desert. Replaced the stock tires on my Versys X with the Shinko 804/805 tires. The 804 front stays planted where ever I point it. Handles extremely well in loose soil, mud, rain and even snow. On asphalt the traction and handling is impressive the bike stays steady with no sketchy action. I've had these tires on my larger ADV bikes and the tire wear is impressive so on this new mini ADV bike they might last 7,500 or more miles! I got these to go with the 805 rear tire on my KLR650. I had heard good reviews so wanted to try them as a replacement for the pour OEM tires. While the rear tire was great, not so much in my opinion on the front. Before 3000 miles they started cupping bad. They also wash out in turns in the dirt and sand. On the road they did okay before they started to cup. I've replaced them with another brand. I do however like the 805 rear and have over 6000 miles on them and still doing fine. I just didn't like the front, the way they handled or the way they lasted. I can't recommend them. Quiet on highway, no vibrations, or noise that I could hear. Reducing psi to 20 made these great off the road and trails. On highway, they did best at 32 psi. 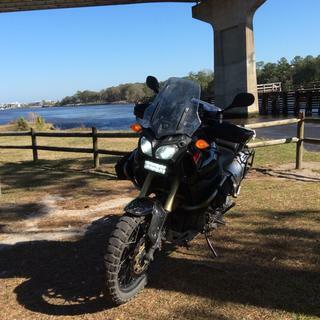 I love these tires on my BMW R1200GSA - both my old 2007 and my 2016. I run the smaller size on the 2016 because i prefer a skinnier tire with taller sidewall for offroad. They get 8k miles, handle great in nearly all conditions and ride silky smooth. I put a set of these Shinko 804/805 tires on my 09 KLR before setting out for Dawson City and the 25th Annual Dust to Dawson event followed by a ride up the Dempster Highway to Inuvik NWT and back. These tires lasted 7,500 miles and I only changed them because I had a set of 90/10 tires for the ride home from Tok AK. The tires performed flawlessly on a heavily loaded KLR from Spearfish SD to Inuvik and back to Tok AK. The Dempster was a slick muddy mess on our way North, the 804/805's gave me confidence in the wet mud and gravel. On the way back the Dempsterwas hard and fast, we rode from Inuvik to Dawson City in one long day. The 804/805 avoided any trouble on the famous Dempster Shale. I have another set on the bike now, my "Go To" tires! Great tire. I have increased my pressure to 34 front and 36 rear and they are wearing great on the highway. An excellent tire combo for the price! I have only 250 miles so far but the first 2 days riding was in pouring rain. After stuffing the tires in they performed great in all conditions except wet clay. I found the tire was great on the street and just as good off road . The only thing this tire did not like was sand . Over all good tire. Love this tire so far! I'm using them on a BMW GS. A mix of dirt roads and highway to get there. Seems to be a great tire for this big bike. The value is certainly there to get them on, at 2500 now so will see how they wear as time will tell. Used almost totally for 2-250 day trips in the Rockies. More of an 80/20 tire. Poor for the off-pavement side of dual sport. I thought these would be a copy of the Kenda Big Block K784, which were at lease decent on all surfaces. However, when the front tire arrived the blocks were much shorter. 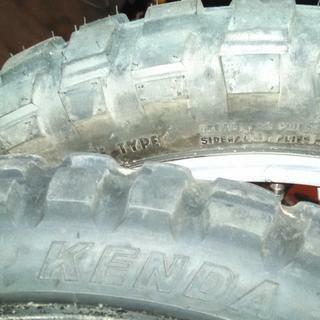 Even with 6,600 miles on them the Kenda Big Block has side knobs half again as high as the new Shinko. Center knobs were only 6mm deep (1/4 inch). Otherwise they appeared to be an exact copy of the Kenda. I put the tire on anyway to give it a try. As I expected the grip off road was very poor. More of an 80/20 tire. It has trouble coming out of ruts and mild washes in 2-tracks. 1/2-inch of powder on hard pack with any camber was squirrely. It may be fine for maintained packed gravel roads but don't expect much if you plan to venture onto unimproved trails and 2-tracks. Highway handling is acceptable but that is where these tires should stay. 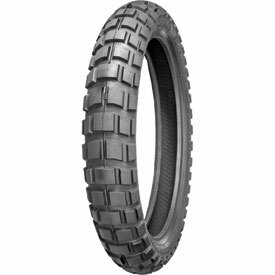 I'm now shopping to replace this new Shinko with a decent dual sport tire that can handle dirt and not act like a ski without an edge when the going starts to get tough. Been using this tire for the last 2+yrs and I consistently get 7-10,000 miles before ride quality deteriorates. Hard braking will wear down the center row of knobs and cause some front end hop at low speeds. No loss of traction or instability at speed when worn, just a little hop and rumble while puttin around on pavement. Best value for a knobbed-type tire. Over 8K miles on this 804. This is a great tire. It does everything well. And I mean by that, it gets the job done. Great on the highway and cornering. Floats on light gravel, sand; not much down hill grip in mud either. But the road handling and fire road handling is what it's best at. Airing down does help a bit. But be sure not to flat spot your rim with the confidence. Really happy with this tire. Good grip and tread life.